The samurai are perhaps the most iconic warrior symbol of Japan—a katana-carrying warrior-class dating back to the 10th century. Samurai were an image of traditionalism, cloaked in kimono, maintaining a code of ethics established sometime around the 11th century. They’ve garnered enough attention from all over to create their own genre of dramatic action films, and can easily be considered the cowboys of Japan. For many Westerners, they’re one of the most enduring symbols of Japanese culture. So, what happened to them? In short, the Meiji era, which destroyed the samurai class in an effort to Westernize. The small oligarchy banned swords and replaced payment with government bonds; eventually the remaining samurai were slaughtered in a Japanese civil war. This is probably why the Meiji period is so seldom romanticized in popular culture (aside from manga series Rurouni Kenshin). The Meiji period, named such after Emperor Meiji, is Japan’s transition, taking place in the mid-1800s, from its feudal Edo society into the “modern era.” It was the era of Japan’s exit out of isolation—an exploration of Western cultures and the establishment of a new government based around English, German, Prussian and French parliamentary systems. Because of the major upturning of the old feudal government and the discard of traditional Japanese values, the era is filled with political strife and massacres. Whether it’s due to the bureaucratic ruthlessness of the era, or the destruction of “all that is cool” (that is, the samurai), the Meiji era seems to be a commonly avoided period for any videogames based in Japan. In fact, until recently, there only seemed to be two videogames even daring to focus their attention on the Meiji-era, each covering separate realms: national political strife and religious tension. 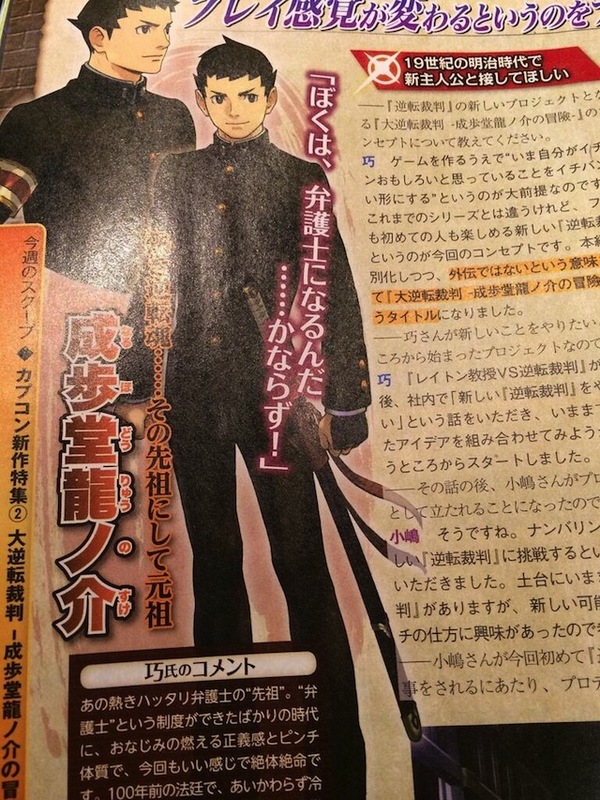 It’s not surprising then, that the next of the Ace Attorney series, Dai Gyakuten Saiban: Naruhodou Ryuunosuke no Bouken, would turn its attention to the foreign affairs of the Meiji era. The series is all about building on the ridiculousness of legal systems, and the Meiji era is all about building judicial and parliamentary systems based on the intense scrutinization and implication of the ideas of the Western world. Dai Gyakuten Saiban finds Phoenix Wright’s ancestor Naruhodou Ryuunosuke and his legal aide, Susato Mikotoba, hanging out with Sherlock Holmes and Dr. Iris Watson (the 13-year-old cutesy pink-haired revisualization of Dr. Watson) in London. That’s where the Meiji-era historical accuracies seep in. From the 1860s onwards, Japanese diplomats and oligarchs started to realize several treaties made with the Western world were unequally balanced, favouring the West over Japan and taking away their control in most foreign trade situations. In the eyes of the shogunate, the best way for Japan to prove their competence and dominance in foreign affairs was by assimilating to the Western world. The Iwakura Mission was one of those quests for assimilation –– 48 administrators and scholars, and 60 students set sail for the United States, the United Kingdom and 12 other European countries to unsuccessfully renegotiate the unequal treaties and to gather information about the politics, technology, military and culture of each area. It’s unclear whether or not Dai Gyakuten Saiban addresses the political and social strife that happened in Japan during the Meiji period. Back home, there were problems within the classes and a lot of systems seemed to forget what it meant to be Japanese. In fact, Naruhodou’s obvious brandishment of a long sword directly contradicts the Meiji period’s Haitorei Edict, which banned anyone, aside from the wealthy and the military, to carry a sword. This edict and rejection of traditionalism is shown a lot better through Total War: Shogun 2‘s expansion Fall of the Samurai, but even this game misses the point. It covers a very short portion of the Meiji period, focusing on the Japanese civil war between the samurai and the new Japanese conscript military. While it shows the tech, like railroads and artillery warfare, and some political unrest the country dealt with, it fails to show the political aftermath that would eventually launch Japan into the modern era and into World War II. It also drops the United States military in there, and credits the US for advancing certain technological features in Japan, which, for the most part, wasn’t a thing. Perhaps such failures and errors are inevitable when choosing an era of contradictions. Fatal Frame II: Crimson Butterfly’s past “ghost” timeline fills the audience with fallacies about the period, but nevertheless successfully delivers a commentary on Japan’s shinto religion during the Meiji period. It’s during this period that the Japanese government made shinto the official religion of the Emperor, whereas before Japanese Buddhism and shintoism usually just coexisted with each other. Shinto shrines are placed throughout Fatal Frame II, without any obvious nods to Buddhist ideals. This is the only indication of anything taking place during the Meiji period, aside from one mention of a date and the antiquated clothes that the ghosts wear. Maybe the historical significance of the Meiji era is lost on videogames because it isn’t a fun era of Japan. It’s a fact-packed bureaucratic path to Japan’s self-identification. It’s unlike the Kamakura and Muromachi feudal periods of Japan, where there are huge stone castles and warring dynasties—it’s a period of deceit and rejection, without the warfare across the continents or extravagance. For Westerners, the Meiji era isn’t a journey to a different culture; it’s a view of the establishment of Western ideals into yet another culture because of unequal treaties and unfair nations; even games set in the era, like the newest Ace Attorney, take place in the West, almost as if it’s an attempt to run as far away as possible from that era of Japan.